Last March 27th 2019, during the General Assembly of the members of the IAHCRC Consortium, the results of the election of the Scientific Coordinator and Deputy Coordinator for the biennium 2019 – 2020 were communicated. 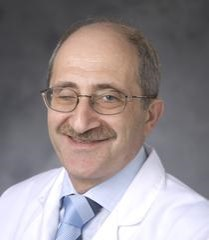 Prof. Mohamad Mikati (AHC Clinic at the Duke University School of Medicine, Durham, NC USA) officially settled as Scientific Coordinator of the IAHCRC Consortium, and Prof. Alexis Arzimanoglou (Neurology Department at the University Hospitals of Lyon, France) officially settled as Deputy Coordinator. Many sincere thanks to both of them for accepting to remain as Scientific Coordinators, to continue their precious action in making the Consortium more stable and more and more effective. 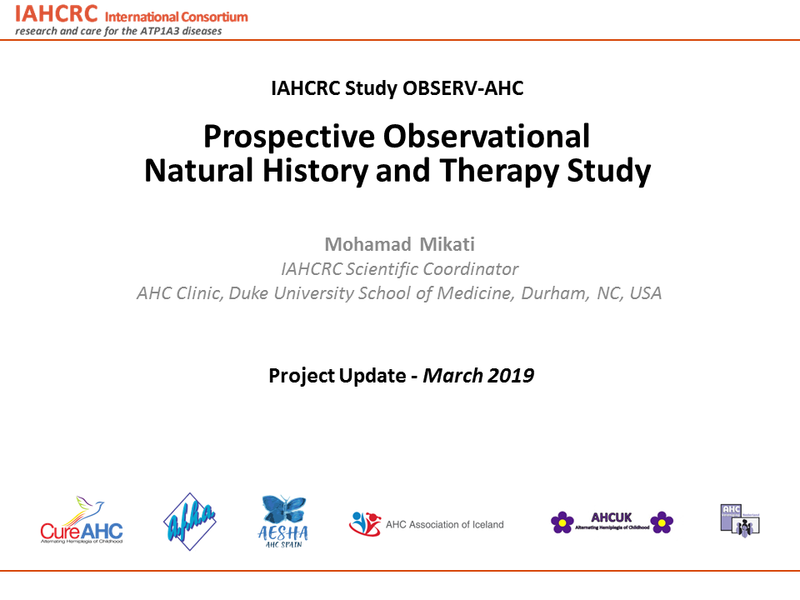 With their scientific coordination and the contribution from all its members, the IAHCRC Consortium will surely play a key role in these next two years, for the progress of the collaborative research on AHC and all the ATP1A3 diseases, towards the final goal of an effective treatment and a better care for the patients. 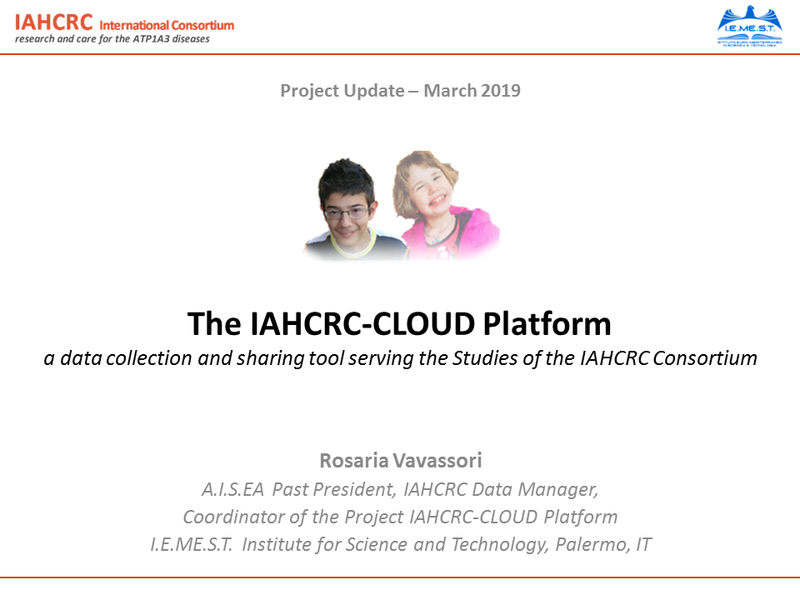 During the General Assembly, Prof. Mikati gave an update presentation about the OBSERV-AHC Study; the IAHCRC Data Manager Rosaria Vavassori presented an update about the IAHCRC-CLOUD Platform, currently used for the data collection for the OBSERV-AHC Study and for other Studies and Projects already planned. 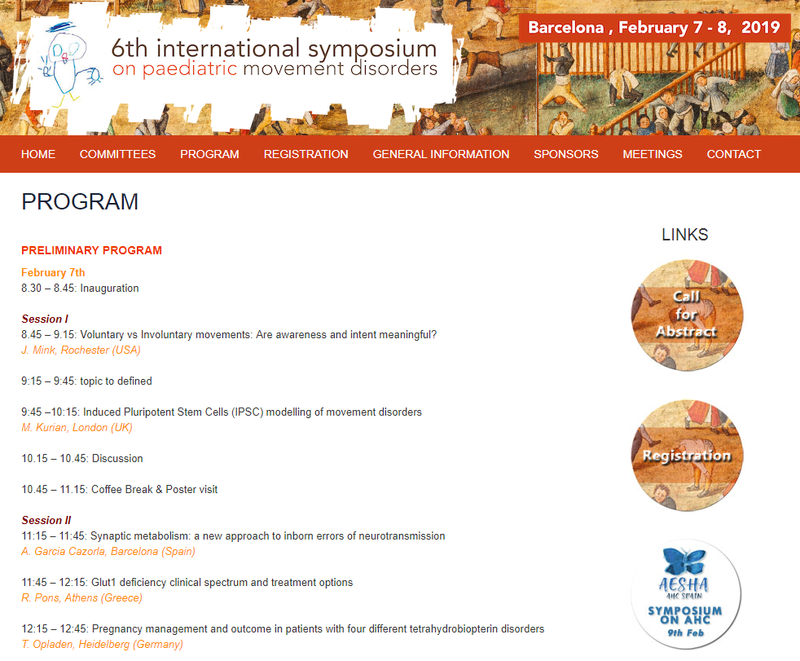 We are pleased to forward the invitation to the Symposium on AHC that will take place next Saturday 9th February 2019 in Barcelona, Spain. 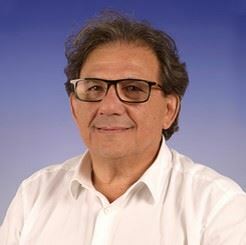 Prof. Mohamad Mikati will present the OBSERV-AHC Study that has just been launched, and the IAHCRC Data Manager will talk about the role of the Patient Associations for the development of the research on a disease as rare as AHC. 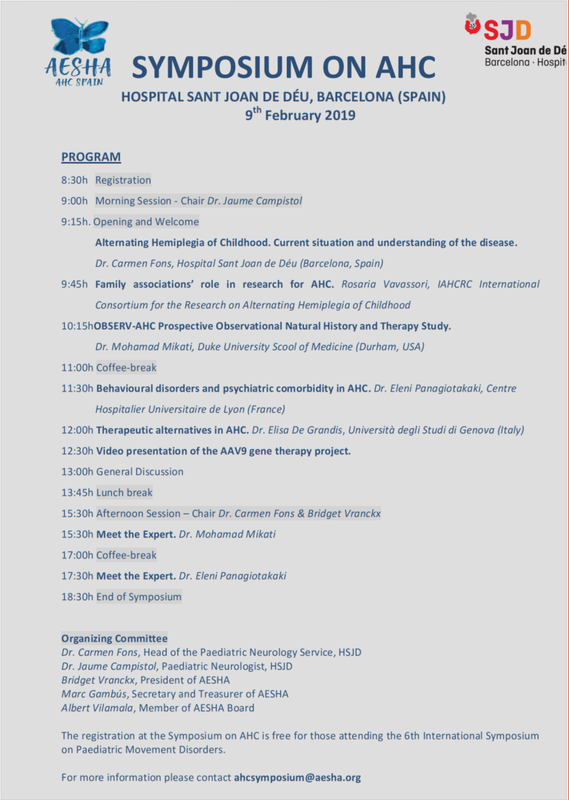 The main clinical features of AHC will also be presented, by Dr Carmen Fons and other international experts, as well as the current and possible future therapeutic options, including gene therapy. 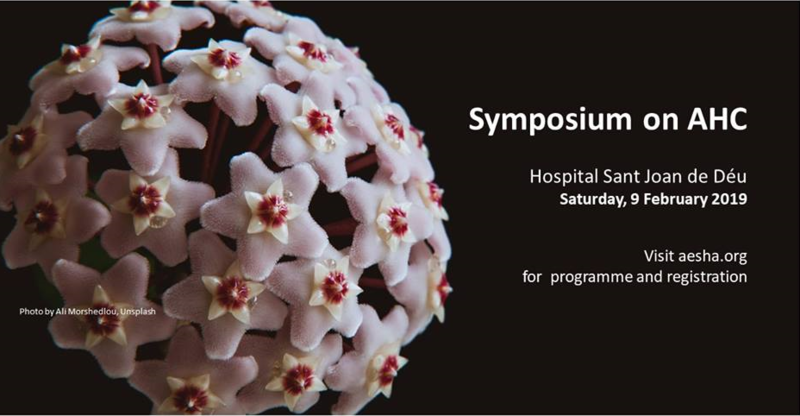 Many heartfelt thanks to the organizers of this Symposium, for their continued committment to the study on AHC and for their support to the research for the development of an effective treatment. 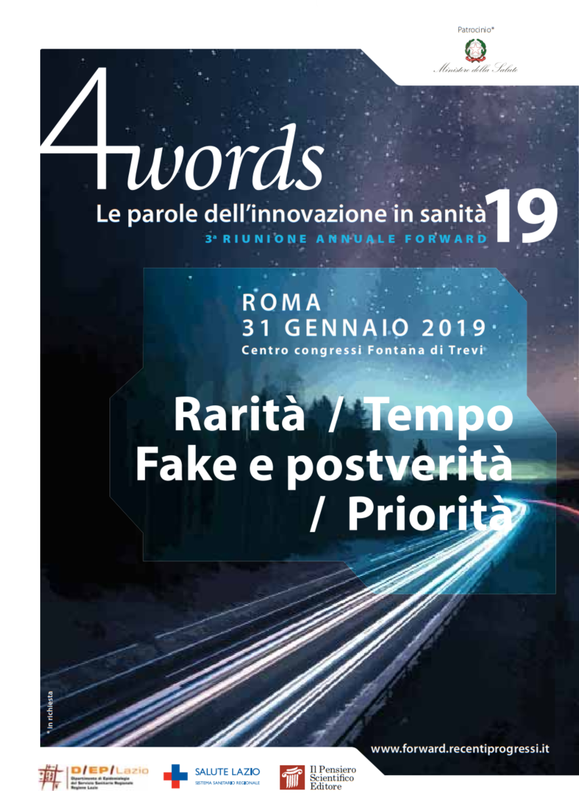 THE IAHCRC CONSORTIUM AT THE CONVENTION "4WORDS - INNOVATION IN PUBLIC HEALTH"
Dr. Rosaria Vavassori will participate as speaker in the Convention "4 Words - Innovation in Public Health" (Rome, 31 January 2019), organized by the National Network FORWARD for the Communication in Public Health. She will present her experience as parent and professional in the support to the research on a disease as rare as AHC, in particular her recent involvement as Data Manager of the IAHCRC Consortium and Coordinator of Project for the IAHCRC-CLOUD Platform. 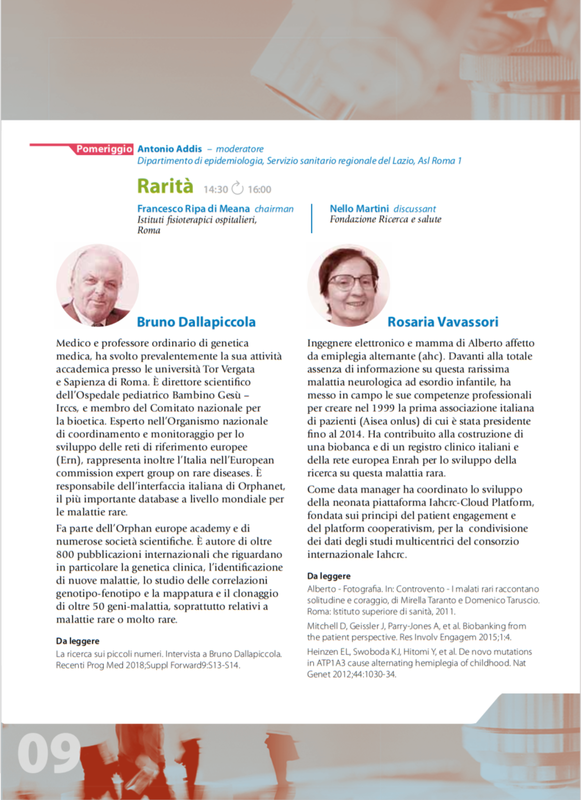 Prof. Bruno Dallapiccola, director of Orphanet Italy and Scientific Director of the Research Institute and Hospital Bambino Gesù in Rome, will be co-speaker in the session dedicated to the rare diseases. For more info and registration, visit the FORWARD Website at this link.